By Ryan Thomas – Article from Los Cabos Magazine. Issue #8. published October 2002. No other liquid is surrounded by as many stories, myths, legends and lore as tequila and its sister beverage mezcal. As wine and whisky have taken their place in modernized western culture, so too has tequila. Once only a drink for bandidos and rancheros, tequila is as much at home in the fist of today’s business yuppie as a cup of Starbuck’s coffee. While plenty have sampled various breeds of this zesty spirit in the form of a margarita, many more are discovering that good tequila is a drink to be enjoyed like a fine cognac or scotch. Many have put away the salt shakers and sliced limes—they sit down, relax and savor the taste of liquid fire – sip by sip! As North America’s first distilled drink, and its first commercially produced alcohol, the history of tequila is long and rich. Its roots reach back into pre-Hispanic times when the natives fermented sap from the local maguey plants into a drink called pulque. The history of tequila’s development from the traditional beverage to the modern spirit parallels the often turbulent, chaotic growth of Mexico herself, and is equally obscure to outsiders. Mezcal wine, tequila’s grandparent, was first produced only a few decades after the Conquest that brought the Spaniards to the New World in 1521. It was variously called mezcal brandy, agave wine, mezcal tequila and finally simply tequila—appropriately named after Tequila, a small town in a valley in Jalisco state, México. Read more about Mezcal. A “jimador” cuts the leaves or “pencas” from the mature agave. Agave, the plant from which tequila is distilled, played a much larger role than just being the source of an alcoholic drink. Its leaves were used for a hemp-like fiber to make mats, clothing, rope and paper. It was also the source of the nutrient and vitamin-rich brew, pulque. Distillation of pulque, tequila’s distant ancestor, into something stronger may have originated by the Conquistadors as early as the 1520s. After the Conquest, the area around today’s Jalisco state was originally called New Galicia by the Spanish conquerors.The community we now know as Tequila officially became a village in 1656. In the 1700s, mezcal wines became an important product for export because the town of Tequila lay on the route to the newly opened Pacific port of San Blas. Another interesting error is an urban legend related to a worm. The worm-in-the-bottle myth is old and tired. The truth has been broadcast and expounded for years by the cognoscenti of tequila, in newspapers, magazines and on the internet. Yes, it’s true, some American-bottled brands put one in their bottle to impress the gringos and boost sales, but it was a marketing ploy developed in the 1940s, not a Mexican tradition. Read more about the Tequila Worm. Another common misunderstanding is that tequila is made from a cactus. 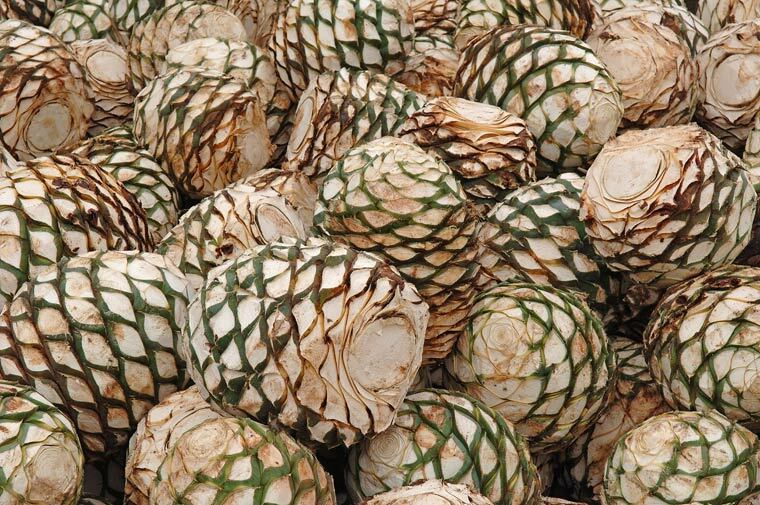 The reality is that tequila is made from distilled sap from hearts of the agave plant. This plant is actually related to the lily and amaryllis. It is known as a succulent and, although it shares a common habitat with many cacti, it is not one itself. A mature agave has leaves 5–8 feet tall, is 7–12 feet in diameter and has a life span of 8–15 years. 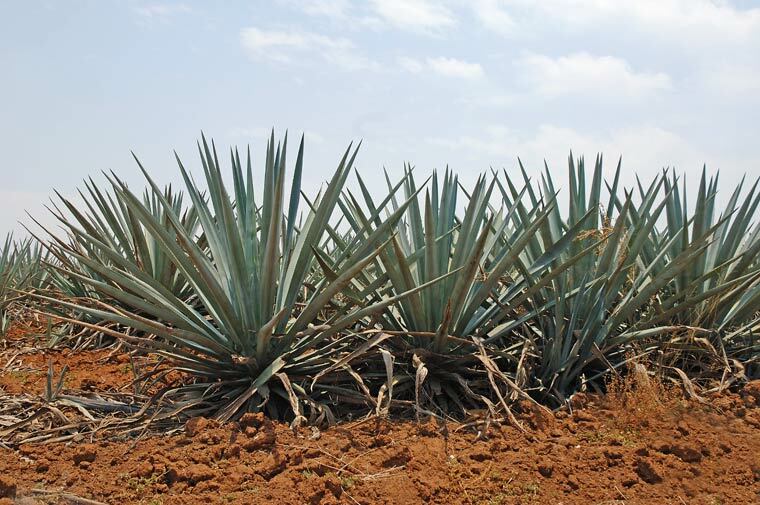 There are 136 species of agave in México, of which the blue agave, agave tequilana Weber azul, is the only one allowed for use in tequila production. Several different species of agave are allowed for use in mezcal, including tobala, a rare and wild species. And just to clear the record, no Mexican alcoholic drink is made from cactus. Tequila is known to have been the cause of antics and behavior not normally observed in human beings. There’s a large market of excellent tequilas available in México at $20–$30 USD, and a very good choice in the range from $30-$50 USD. Under $20, most of the tequilas are mass-produced for the local market, and usually a mixture (not 100% agave). Above that price, they’re aiming mostly at the snobbery of the export and premium market, often with collector bottles and recently introduced individually numbered bottles. Taste is the ultimate deciding factor. Some people prefer the rougher edge of the young blanco tequilas with their more distinct agave flavor. Others like the sharper, almost peppery flavor of a middle-aged reposado. And some may prefer the smooth, woody aroma in an older añejo. Like single-malt scotches, or small-brewery sakes, tequilas vary according to the company making them, the process, and the growing environment. The temperature, soil, types of equipment, age of the plants and the means by which the plants are baked and aged all affect the flavor and body. Fancy packaging, wooden boxes and elegant bottles are now common with premium tequilas. They have become collector’s items in their own right. While they don’t add to the basic quality of the drink in the bottle, they do add to its charm and certainly its visual appeal. Try them first at a local bar, then decide which to buy. But be cautious as you partake of this piece of Mexican heritage. Tequila is known to have been the cause of antics and behavior not normally observed in human beings.